Simple equipment will give you professional mojo results. Here are suggestions for your kit bag. Protective case: A case will help protect the delicate glass screen of your phone if you drop it. Screen protector: A heavy-duty screen protector will reduce the risk of cracks and scratches on your screen and lens. Cleaning cloth: The soft cloths used to clean eye glasses are great for removing dust and fingerprints. Clean the lens before taking photos or shooting video. every time you use your phone to shoot videos or take photos. There’s nothing worse than arriving at an interview or filming location to discover you’re out of battery. 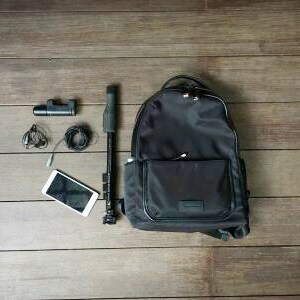 Keep an external charger or power bank in your mojo kit bag to stay full charged on the move. Tripod: Using a tripod will give you stable video footage and sharper photos. Many mojos use a robust tripod like the Manfrotto BeFree, but because you don’t need to support a heavy TV camera or DSLR, an inexpensive lightweight tripod will also give great results. Monopods and selfie sticks: A monopod is a good alternative to a tripod, especially one of the models with spreadable feet. A high quality option is the Manfrotto 560B1. A selfie stick can be used for pieces to camera – as Sky News Australia began doing in 2015 – but do keep in mind the front-facing lens on many smartphones isn’t as good as the rear-facing lens. Tripod mount: To attach your smartphone to a tripod or monopod, you’ll need a tripod mount with a screw mount at the base which can be used to attach your mount to any standard tripod. Cheap mounts can break easily so consider a professional brand like the Shoulderpod S1 or the Sevenoak SK-PSC1. 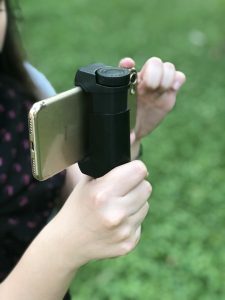 Grip: A ‘grip’ allows you to attach your smartphone with an external lens, a microphone and light, and move around as you film. They can be attached to a tripod or carried handheld. Unlike a gimbal, a grip does not provide any stabilisation if used handheld. Popular brands include Beastgrip, DreamGrip and Helium. Gimbal: A gimbal is not a mojo essential, but can be useful. A gimbal combines a smartphone mount with a motorized grip. It keeps the phone camera pointing at an object being filmed while you move around. Popular brands include DJI, FeiyuTech, Movi, Zhiyun, and LanParte. Many gimbal mounts cover the phone’s microphone socket, so you may need to record audio using a second phone or external recording device. Two gimbals that do not cover the microphone port are the LanParte HG-01, and the FeiyuTech G6 Plus. Clip microphones – also known as lapel or lavalier microphones – are ideal for recording interviews in noisy or windy areas. The microphone attaches to your interviewee’s clothing, and the other end plugs into your phone. Widely used microphones include the Rode Smartlav and the Boya BY-M1. These microphones have a 3.5mm jack, so if your phone doesn’t have a 3.5mm port, you will need an adaptor. You can also buy clip microphones with lightning jacks for iPhone 7 and above – like the Sennheiser Clip Mic. 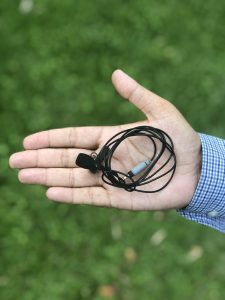 Smartphone headsets: If you find yourself in the field without an external microphone, the microphone on your mobile phone headset can also record good quality audio. Clip microphone dual adaptor: If you want to record more than one person – for a two-person interview, for example – you will need two clip microphones. These can be plugged into a dual adaptor like the Rode SC6. If you are on an iPhone, the Rode SC6-L adaptor does away with the need to use a lighting-to-3.5mm adaptor. Dual-head clip-mics: An alternative to using two clip microphones and an adaptor is to buy a dual-head clip microphone. Popular choices include the TONOR mic, or the Comica CVM. These microphones record both audio sources into a single audio file so there is no option to mix afterwards. Audio mixers: If you want to control the recording level of each microphone independently, you can use a smartphone audio mixer like the Saramonic SmartMixer or the Roland GoMixer. Extension cords: For medium shots or for filming from a distance greater than one meter, you should plug your clip-microphone into an extension cord like the Rode SC1. This extension cord works with both Rode Smartlav and Boya BY-M1 microphones. Handheld microphones: Handheld microphones are ideal for recording interviews, pieces to camera, and for recording ‘natural sound’. One end plugs in to your smartphone, and the other is attached to the microphone, which you hold in your hand. Popular brands include Rode, iRig, Sennheiser and Apogee. To protect from wind noise, buy a foam windshield to cover the microphone. 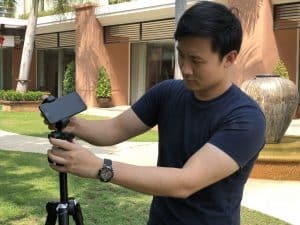 Wireless recording: For recording at a significant distance, or if your subject is moving around, you may wish to invest in a wireless smartphone microphone set. Your interviewee wears a microphone connected to a transmitter, and the receiver is connected to your smartphone. 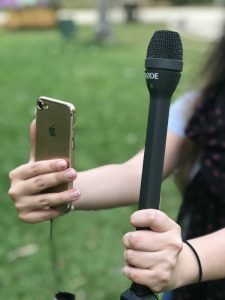 Popular choices include the Rode NewsShooter, or the Samson Go Mic Mobile, a wireless system that can connect two microphones (clip or handheld) at once, and works on USB C, Micro USB, 3.5mm and lightning. ‘Two-take’ audio: An alternative to extension cords and wireless systems is to use a second phone. Plug a clip-microphone into it and ask your interviewee to put this second phone in their pocket and attach the microphone to their clothing. This allows you to record their voice as you film from a distance with your primary phone. The two recordings can be matched up during the editing process. Natural light: Filming or taking photographs outdoors give excellent results without external lights. When filming, lock exposure to prevent automatic changes to the exposure if, for example, a cloud covers the sun, as this is distracting for the viewer. If you are filming indoors, try to film near a window that allows in plenty of natural light. Artificial lights: Popular smartphone light brands include Lume Cube, Manfrotto, iBlazr, Godox and Genaray. Some – like Manfrotto and Godox lights – come with a cold-shoe so you can add them to a tripod mount. A higher-end light like Rotolight will allow you to angle the beam to bounce it off other surfaces. And you can always use free-standing lights or soft-boxes to light an interviewee, as you would with a television camera. 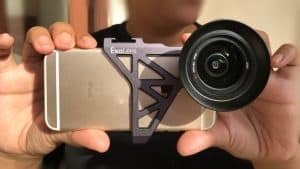 A wide range of telephoto, wide and macro external lenses for smartphones are now available from manufacturers like Olloclip, Exolens, Moment and Moondog. 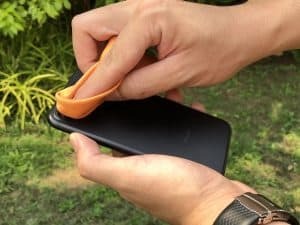 These typically attach to the phone via an external mount or with a clip that snaps onto the phone, and some brands allow you to attach ND filters. 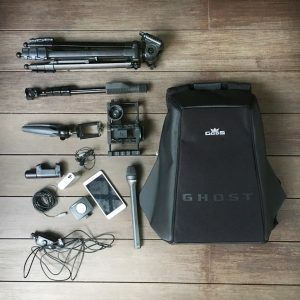 How much kit is enough? Adding external lights, lenses, grips and gimbals may give you a better result – but remember the more equipment you need to carry, the less ‘mobile’ you will be! We recommend you buy a basic kit, and invest in specialised equipment that helps you do your job as you go along. 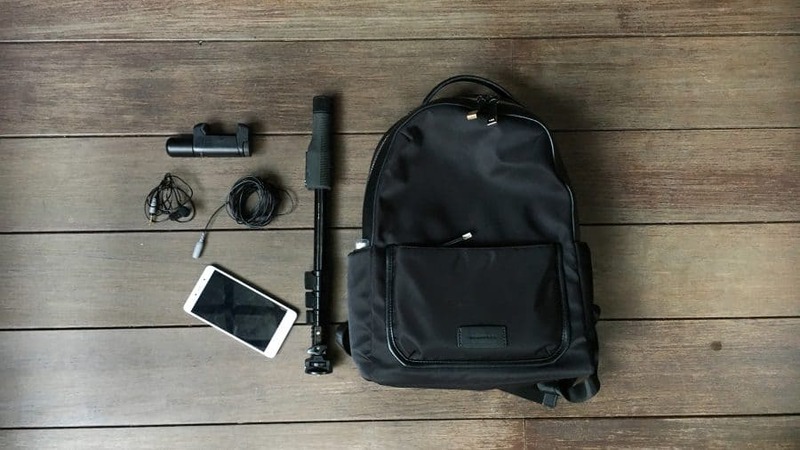 Mobile Journalism makes journalistic video productions more affordable, flexible and faster. This mojo manual shall encourage and empower journalists to produce more video stories just using their smartphones. It was written by mojo expert Corinne Podger and produced with a team of trainers and journalists, supported by the Konrad-Adenauer-Stiftung’s Media Programme Asia. Learn more about who produced this manual for you. 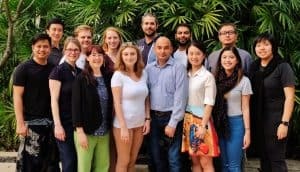 Become part of the Mobile Journalism Community! Mobile Journalism makes journalistic video productions more affordable, flexible and faster. This MoJo Manual shall encourage and empower journalists to produce more video stories just using their smartphones. It was produced by a team of trainers and journalists, supported by the Konrad-Adenauer-Stiftung’s Media Programme Asia.